The Peking Union Medical College Hospital (PUMCH) is the most renowned hospital in the People’s Republic of China. Located in the center of modern Beijing close to Tiananmen Square and the Forbidden City, it was founded as early as in 1921 and has since provided health care services to many prominent political and social leaders of China. Designated by MoH, PUMCH is the national medical technical support center for diagnosis and treatment of severe and complicated diseases. With the rapid pace of social and urban development in the entire country PUMCH has been looking to remain at the cutting edge of technology in catering to its laundry needs. The laundry, used for its own health care facilities as well as those of adjacent clinics, has been undergoing a considerable upgrade. In 2008, the first phase of their new barrier laundry was commissioned. In the second phase, completed in 2010, the facility gained another three units, making a total of seven large Pullmans and an equal number of tumble dryers, gradually replacing the old laundry equipment and setting new hygiene standards in Chinese health care laundries. In the third and final upgrading phase, PUMCH acquired an additional 6 x Pullman Barrier Washers and an equal number of matching Tumble Dryers and 4 x rolls of the largest ironer, the C-Flex that will be split into 2 x high performance ironing lanes. 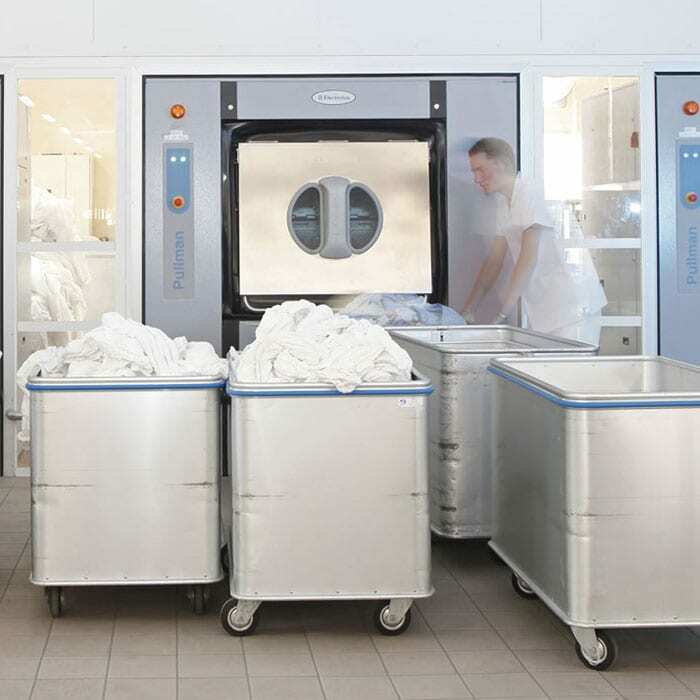 The installation stands as an impressive reference for a modern health care laundry setup, setting new levels of washing performance as well as improving the handling of linen and working conditions of all staff. Completely finished and running, PUMCH laundry is the biggest solution of its kind ever done by Electrolux Professional. 11 years after the first meeting with PUMCH, Electrolux Professional was asked to assist in making PUMCH a Hospital Laundry training center and a benchmark for all Hospital laundries across China, including support in defining a standard on linen Hygiene in Hospitals to be submitted to the People Republic of China’s Ministry of Health. This is an enormous opportunity for Electrolux Professional, becoming a unique reference in the potentially biggest market in world. A result of almost 20 years relationship with this customer and another illustration of the sustainability of Electrolux as a trustworthy international partner. The best defense against the spreading of micro-organisms and cross infections.